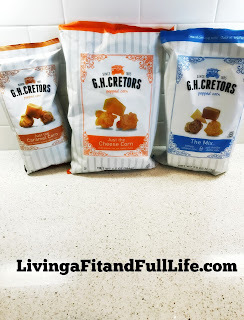 Living a Fit and Full Life: Enjoy Handcrafted, Gourmet Popcorn from G.H. Cretors! Enjoy Handcrafted, Gourmet Popcorn from G.H. Cretors! FIVE GENERATIONS OF PERFECTING THE DETAILS. To most, popcorn is just a snack. To us, popcorn is so much more than that. It’s a mouth-watering break from your day. It’s a flavor-filled moment to yourself. It’s a love letter sent straight to your taste buds. And at G.H. Cretors, it’s the reason we get up in the morning. Since 1885, we’ve been creating handcrafted, gourmet popcorn one mouth-watering batch at a time. Every perfectly-popped detail is intentional—from the premium, aged cheddar cheese that smothers our fluffy, delectable kernels, to the creamy caramel cooked by actual Candy Chefs. Yes, “Candy Chefs” are a thing. It all adds up to bringing you the most obsessively delicious popcorn you’ve ever tasted. Don’t say we didn’t warn you. We say NO to GMOs. To put it simply, if it’s not pure, it’s not in our popcorn. We strive to provide the most authentic popped corn we can by using only the highest-quality, real ingredients. We use Non-GMO popcorn and Non-GMO ingredients whenever possible in all of our flavors, and only organic ingredients in our Organics line. A better way to sweeten. Aside from its rich flavor profile, brown rice syrup has other pros—which is exactly why we use it. Unlike other sugars that cause “sugar highs,” brown rice syrup offers a steady supply of energy over a longer period. Bonus: It also has a wonderful, crisp sweetness. Most caramel corns still opt for corn syrup. Most, but not us. Popcorn is naturally gluten-free, and we’re committed to keeping it that way. We don’t process gluten in our facility, and all of our products are Certified Gluten-Free. For those with dietary restrictions or a gluten-free preference, look no further. Blend rich, buttery caramel corn and premium, aged cheddar cheese corn, and you’ve got a mouth-watering mix of sweet and salty. Or as we like to call it, The Mix. 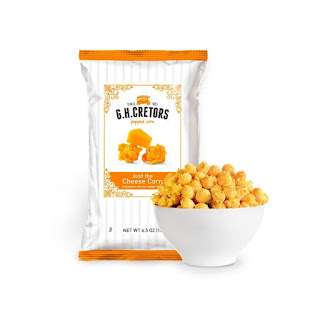 Real, aged cheddar cheese poured on the fluffiest, gourmet popcorn you’ve ever tasted—that perfectly sums up this divinely delicious, cheese lover’s dream. Handcrafted in old-fashioned copper kettles, one batch at a time, is the secret to success for this crunchy, creamy, caramel delight. Enjoy handcrafted, gourmet popcorn from G.H. Cretors! I'm a huge fan of popcorn, especially cheese and caramel popcorn so these gourmet popcorns from G.H. Cretors were right up my alley. G.H. 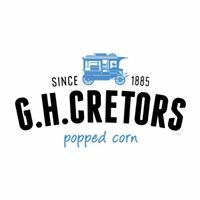 Cretors popcorn is made to perfection! Not once did I bite into a hard piece of popcorn. Each kernel was popped to perfection. G.H. Cretors Just the Cheese Corn is amazingly cheesy! The cheese flavoring is intense just as it should be. Absolutely hands down some of the best cheese popcorn around! G.H. Cretors Just the Caramel Corn is also amazingly delicious and just what any sweet tooth lover needs in their life. Each bite is perfectly sweetened with crunchy, creamy, caramel that my taste buds went nuts for! The Mix by G.H. 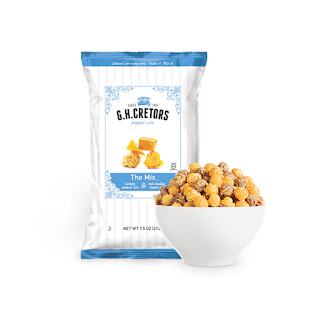 Cretors is just that, it's a mix of Just the Cheese Corn and Just the Caramel Corn and together the flavors are awesome! I never would have thought to combine the two, but when you do there's an amazing flavor combination that's absolutely perfect. My entire family absolutely loves G.H. Cretors popcorn and I foresee many many more bags of this stuff in our house! Click HERE to find a store near you that sells G.H. Cretors! Click HERE to learn more about G.H. Cretors! Follow G.H. Cretors on social media!